The Libraries has, for many years, checked out equipment to students for use in the building and to take home. Starting with laptops in 1999, other equipment has been added to the roster since then including iPads, tablets, cameras, video cameras, calculators, digital voice recorders, DVD and Blu-ray players, scanners, projectors, headphones, chargers and cables. With no technology budget to replace this equipment, this proposal seeks funding to replace older out-of-warranty models and add to the equipment available to check out. New equipment sought are 13” MacBook Air laptops which will join our iPads, Dell Venues, and Dell laptops. The MacBook Airs will be available for check out for 3 days. There has been an increase in interest in laptops over tablets and the MacBooks will give students a choice between iOS and Windows, laptops or tablets. iPad keyboards have been included in the equipment list to satisfy the need expressed by students to have a keyboard for iPad use. Among the replacement pieces are calculators, voice recorders, digital cameras and accessories, microphones, projectors, and camcorders. New items include memory cards, projector screens and Bluetooth speakers. All items selected have been vetted and determined to be heavily used or consistently requested. Explain in detail how you arrived at the numbers above. There are 449 pieces on the equipment list. If they were used individually, 449 people could use them simultaneously. However, some items will be used in tandem with other pieces so the number of simultaneous users will be less. The John C. Hitt Library is open 105 hours a week. The equipment made available for students to check out support their coursework and make it possible for them to use items that they only need occasionally for project preparation and wouldn’t make sense to purchase on their own. While many students have personal devices like laptops and tablets, in a university as large as UCF there are still significant numbers who do not have or do not want to carry their own equipment around with them. The popularity of having a variety of items available for checkout is supported by the circulation statistics which show that all equipment is used, all the time. The success of the project will be measured using circulation statistics to determine the number of times items have been checked out. These statistics have helped guide the compilation of the list of equipment included in this proposal. We have also reviewed the age of current items being checked out to identify items in need of replacement. 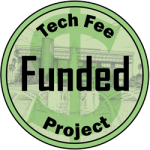 Without a dedicated technology budget, the Libraries relies on technology fee funding to implement new innovations and replace aging equipment. Extended warranties are included in all purchases and obsolescence is anticipated. By staggering purchases, surveying staff and users regularly, and monitoring new technologies, Library IT keeps current on the technology needs of users, supports and maintains current equipment and plans for future enhancements. The items identified for purchase can be acquired through the UCF Technology Product Center. Prices/models listed in the budget are current but may change according to availability or because new models are released. In some cases, enhanced or improved models can be purchased for the same price. Photos have been included of the items. No facilities improvements or furniture are requested. No space is needed for the project.